I love tartare, beef or tuna, both work for me. When I see it on a menu I just know I will end up ordering it! But luckily for me I didn't need to be in any restaurant this weekend in order to indulge in some delicious tuna tartare. My friend Kate came over Saturday night with a little treat from her dad's birthday party - tuna tartare! I was so excited to try it, and let me tell you - it was a hit! When committing to making such a delicious dish, it is important that you do get really good quality tuna steak because that is the star of the dish and really needs to be top notch. The flavouring of the dish was quite asian but with diced avocado in there as well you couldn't go wrong. Creamy in a sense yet the diced tuna still holds its own. This tartare was an appetizer to their main dinner and was hoovered! I'm lucky I got some before it was all gone. So if you are looking for a great entertaining recipe that is sure to WOW your guests, this my friends is it! Recipe by Ina Garten (The Barefoot Contessa) and one of my personal favs! -Cut the tuna into 1/4-inch dice and place it in a very large bowl. - In a separate bowl, combine the olive oil, lime zest, lime juice, wasabi, soy sauce, hot red pepper sauce, salt, and pepper. Pour over the tuna, add the scallions and jalapeno, and mix well. - Cut the avocados in half, remove the seed, and peel. Cut the avocados into 1/4-inch dice. 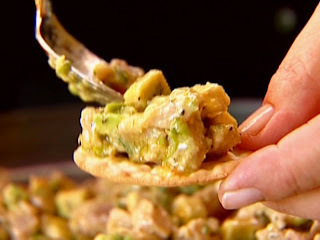 Carefully mix the avocado into the tuna mixture. - Add the toasted sesame seeds, if using, and season to taste. Great post Ems! It really wasn't that hard to make, much easier than I expected. Lots of chopping but all the different ingredients add so many layers of flavor and are totally worth the prep time. Very popular with all the guests both times it was served!